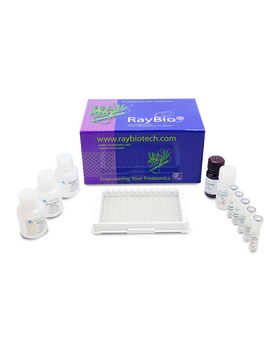 RayBio® Human GATA-1 Transcription Factor Activity Assay. 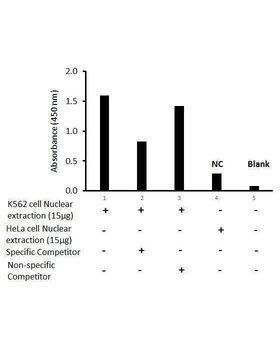 This assay uses a dsDNA coated plate with canonical GATA1 binding sequences to semi-quantitatively detect active GATA1 in lysates or nuclear extracts. Dry ice shipment (additional fee). 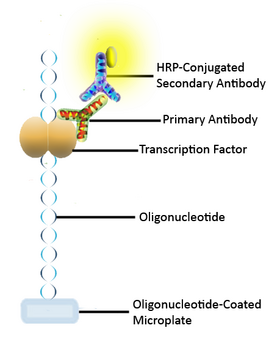 The olionucleotide/antibody pair provided in this kit recognizes human GATA-1 in whole lysates and nuclear extracts. GATA transcription factors have a characteristic feature that they all bind to the DNA consensus sequence (A/T)GATA(A/G) of target gene promoters by two adjacent zinc fingers (Cys-X2-Cys-X17-Cys-X2-Cys). These transcription factors regulate differentiation, growth and survival of a wide range of cell types. The GATA family consists of six transcription factors, GATA1 to GATA6, between which the DNA-binding regions, two zinc finger domains are highly conserved. The C-terminal C-finger and its adjacent basic region are necessary and sufficient for GATA to bind its cognate sequence, The N-terminal N-finger can also bind DNA independently but has a preference for GATC core motifs. 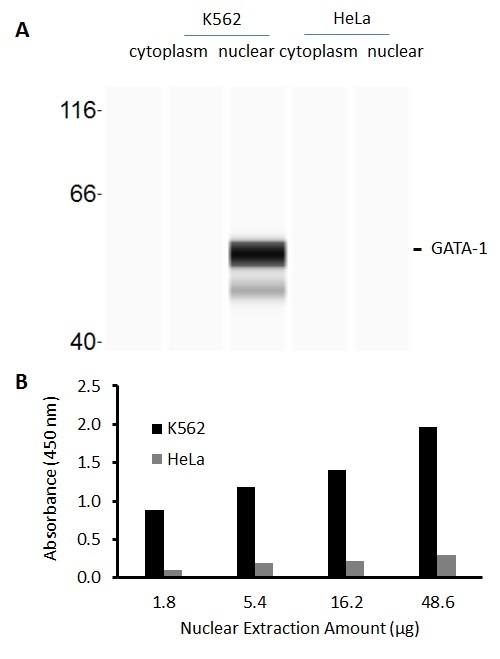 Both fingers participate in binding to the palindromic GATA motif ATCWGATA (W = A/T), resulting in markedly increased affinity. Incubate 2 h at RT or O/N at 4 °C. Add 100 µl of prepared HRP-secondary antibody to each well. Transcription factor activity assay of GATA-1 from nuclear extracts of K562 cells or HeLa cells. In K562 cells, activated GATA-1 is translocated into the nucleus where it binds with its corresponding DNA. 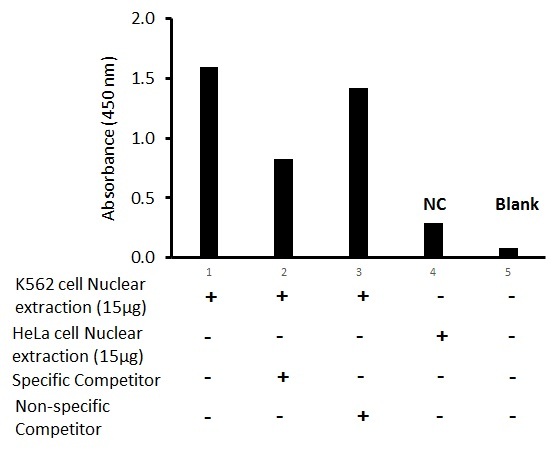 A. Western-blot result of GATA-1 from cytoplasmic and nuclear fractions. B. 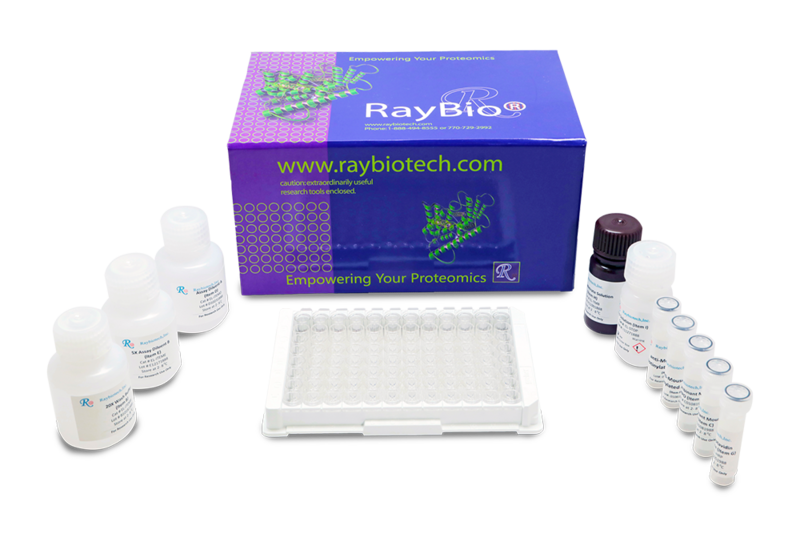 Transcription factor activity assay of GATA-1 from nuclear fractions with the RayBio® GATA-1 Transcription Factor-Activity Assay Kit. Transcription factor activity assay of GATA-1 from nuclear extracts of K562 cells or HeLa cells with the specific competitor or non-specific competitor. 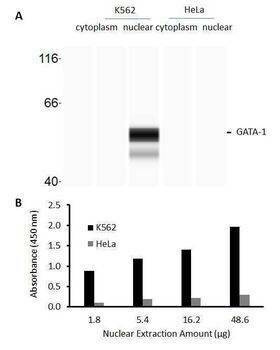 The result shows specific binding of GATA-1 to the GATA conserved binding site detected by using the RayBio® GATA-1 Transcription Factor-Activity Assay Kit. Upon receipt, the positive control should be removed and stored at -20° or -80°C. The remainder of the kit can be stored for up to 6 months at 2-8°C from the date of shipment. Opened Microplate Wells or reagents may be stored for up to 1 month at 2° to 8°C. Return unused wells to the pouch containing desiccant pack, reseal along entire edge. Note: The kit can be used within one year if the whole kit is stored at -20°C upon receipt. Avoid repeated freeze-thaw cycles.